Mikey and I Got Engaged!!! There are so many stories to share, like how Mikey and I met, stories about how long we've been together, and how we've grown together as a couple. For now, here's the story of how we reached a new beginning: by becoming engaged! I'm notoriously known for always expecting a surprise. There's almost no phasing me. Almost. Having watched my own sister get engaged, I learned to see the signs of when to expect "the question". Actually, a couple weeks ago, Mikey was showing me a text conversation between him and his cousin where he told him that he was planning to propose to me. Ever since then, I've been bracing myself for when it would happen, but I had in mind it would occur after a couple months, maybe on my birthday. If Mikey was to propose to me, he'd have to create a perfect scenario that is in no way suspicious, obvious, but still has to be as romantic as one dreams it will be when they're being proposed to. It has to happen as if it's any other day at any other moment. I have to admit: I did not see this coming. For my family, there are several steps to take before a proposal. The first, is to tell my sister and my brother-in-law. The second, is to meet with my parents. My parents are divorced, so Mikey actually had to meet with 3 of my parents total. The third, is to get to the drawing board and create a game plan. While I was away in LA for Kayla Itsines' Sweat Tour, Mikey snuck away and took my parents out to dinner to ask for their blessings. In a separate Facebook messenger group, Mikey conspired with my sister and brother-in-law on how to make this happen. 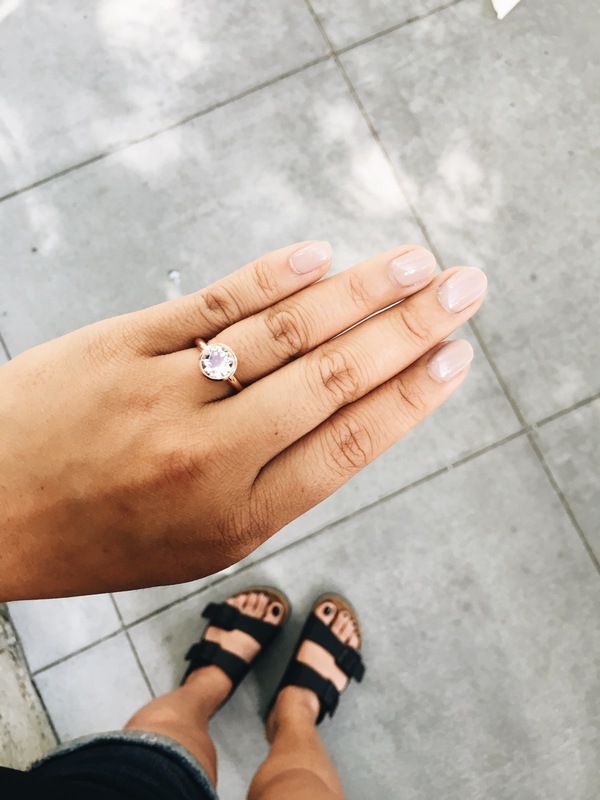 In emails, Mikey chatted with a jeweler in Sweden to find me my perfect pinned-on-Pinterest rose gold engagement ring that I saved years ago. Fast forward one week later, Saturday July 2: We're spending the long weekend in Rocklin, CA with my sister, and we agree to wake up early to head to Sacramento for coffee and a morning at the local farmer's market. Which, c'mon. That's the perfect morning for me. Throw in a Soul Cycle class and omg. 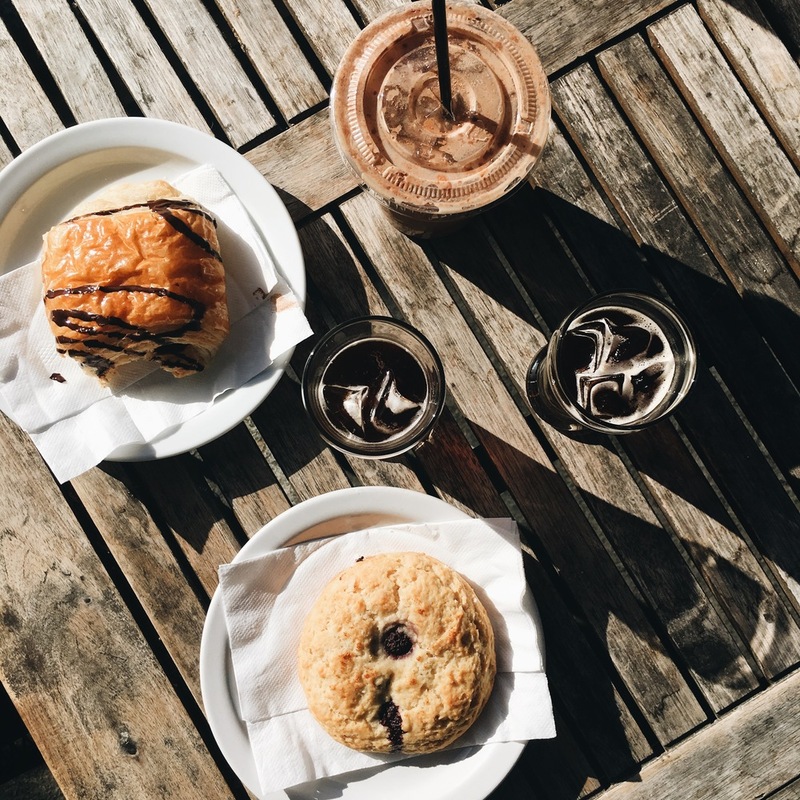 We headed to Temple Coffee Roasters and grab a table on their shady patio. As I'm sipping on my nitro and stuffing my mouth with blueberry scone, Mikey hands me one ear of his headphones and tells me to watch a YouTube video. I'm not going to share what was on the video ;) but I will say that it began with a video of a pug watching YouTube on an iPad, which definitely threw me off. And I gotta admit, I was thinking about the pug during the entire proposal. Where'd he go? What video was he watching? How is i possible for him to sit like that? But I digress. The video concluded with Mikey saying, "Now if you'll please avert your attention to the fool sitting next to you, I have something to ask you..."
And lots of "wait, what? WHAT? Noooooo, but wait yes! *CRIES* What? Yessssss!!!" There's live footage of this on Facebook, but no one needs to hear how high my voice goes when I'm really, really surprised. My sister was also running around with her DSLR taking pictures as it happened. He did it. He caught me completely, 100%, mouth-full-of-scone surprised. In front of my family, sipping on amazing coffee, bright and early in the morning. Great job, Mikey. And I wouldn't have wanted it any other way. I just want to add: I'm SO happy that I decided to get a manicure just the day before this. Good call, Mickey, good call.